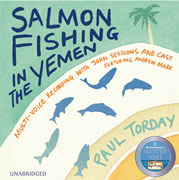 Yesterday I finished reading Salmon Fishing in the Yemen by Paul Torday. I enjoyed the humorous narrative and the tongue in cheek portrayal of government officials. When he goes to the Yemen, he sees a world where ‘faith and prayer are instinctive and universal, where not to pray, not to be able to pray, is an affliction worse than blindness, where disconnection from God is worse than losing a limb’. In the end Dr Jones discovers in himself the ability to believe in the impossible. Thus, the central message of the book seems to be that it is truly human to be able to believe in something, anything. But is belief, on its own and for its own sake, of any value? The trite, ‘Christian’ answer is that belief doesn’t matter unless it is belief in the right thing. But I would disagree. I think moving from a state of unbelief to a place of recognising the need to believe in something is a huge step towards finding belief in God. It is just one step, but it is a giant step and an important one.